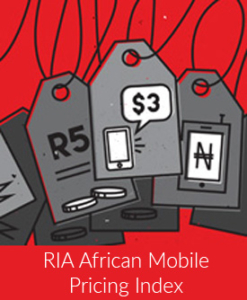 South Africa remains one of the most expensive countries in RIA’s Broadband Price Index. But in the Broadband Value for Money Index, which measures price in relation to quality, South African operators perform better, with investment in high-speed 3G and LTE infrastructure seemingly paying off. The rapidly increasing number of broadband users and their increasing consumption of data as a result of data focused business growth strategies are already taking its toll on the average overall broadband speed in the country. In order to prevent any further degradation of broadband quality, it is imperative that the high-demand spectrum required for LTE services is urgently assigned to operators. Download RIA Policy Brief August 2014 No 6 Broadband.